Current Business, Music and Suffrage Addresses Form Programme. A meeting of the Council of Jewish Women was held in the Selling-Hirsch building at 2 P.M. Wednesday. Much business of the new year was transacted. 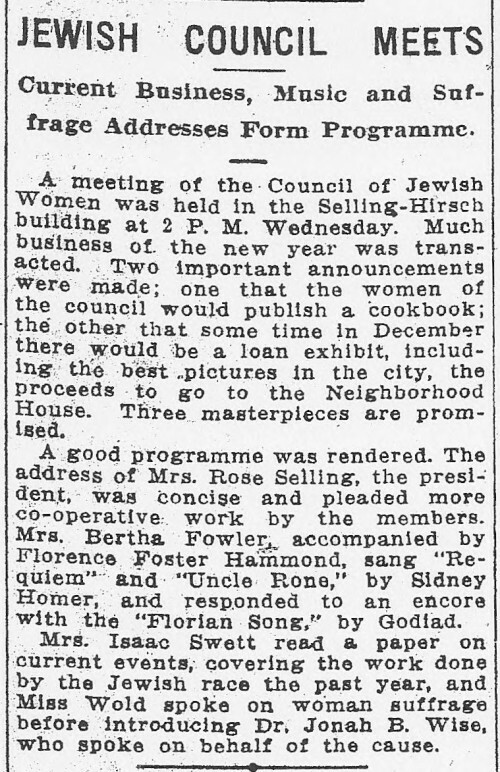 Two important announcements were made; one that the women of the council would publish a cookbook; the other that some time in December that there would be a loan exhibit, including the best pictures in the city, the proceeds to go to the Neighborhood House. Three masterpieces are promised. A good programme was rendered. The address of Mrs. Rose Selling, the president, was concise and pleaded more co-operative work by the members. Mrs. Bertha Fowler accompanied by Florence Foster Hammond, sang “requiem” and “Uncle Rone,” by Sidney Homer, and responded to an encore with the “Florian Song,” by Godard. Mrs. Isaac Swett read a paper on current events, covering the work done by the Jewish race the past year, and Miss Wold spoke on woman suffrage before introducing Dr. Jonah B. Wise, who spoke on behalf of the cause.